Is All Red Wine Vinegar the Same? That’s like asking is all red wine the same. Wine, after all, turns to vinegar if it over ferments and sits too long. Basically, oxygen metabolizes the ethyl alcohol in wine and converts it into the acetic acid. The acid gives vinegar its sharp pungent flavor. There are two different processes that can be used to ferment the vinegar, and each produces a slightly different acidity level. Is it worth it to pay more for a red wine vinegar? Does more expensive change the quality? The taste? Like wine, like anything, I think it’s worth it to pay for what you like. If you love Yellowtail, then that’s a good buy for you. If you melt over a $90 Barolo, then that’s worth it to you. It comes down to your taste. When it comes to choosing a red wine vinegar I think it’s no different. If you tend to look for the cheapest, bargain buy, critics say that Pompeian is the best quality for the lowest price. When it comes to best taste, after extensive tasting, most agree to look for a blend of grapes, as found in a high end brand like, O Zinfandel. My favorite, Cardena’s Lambrusco Red Wine Vinegar is a pricey treat. It has a sweetness along with the tartness that I have never tasted in a red wine vinegar. It’s amazing on my Grandmom’s Italian String Bean Recipe. Bring the water and red wine vinegar to a boil. Add the pinch of sea salt and red pepper flakes. Add the rinsed quinoa and stir. Cover and reduce to a simmer. Turn off heat and let sit for 5 minutes covered. Remove cover and fluff with a fork. Put all marinade ingredients in a high powered blender and whiz until combined. Gently toss all quinoa and about 1 cup of the Red Wine Vinegar Marinade. 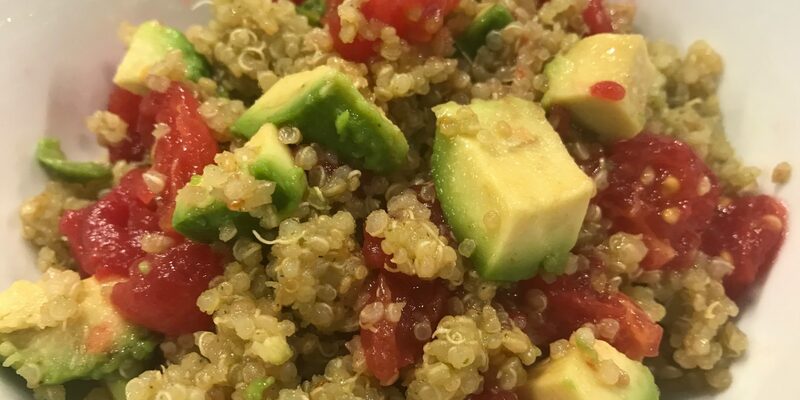 Chop your avocado and tomato and add to your room temperature quinoa. 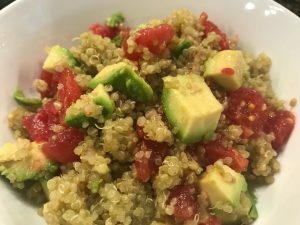 If quinoa is too warm avocado may brown and tomato may get too soft. Adjust seasoning to your taste. Lightly stir and serve. You can make this in advance and store this salad for 5-7 days in the fridge. Just let come to room temperature, toss and adjust seasoning if needed before serving. No worries. Cook quinoa with me. Or Check out the perfect quinoa simmer.